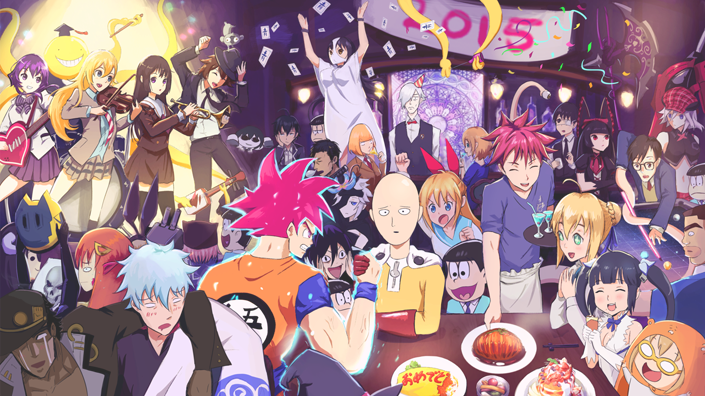 2015 was a year of hype and reboots, with shows like Gintama, DBZ, Ushio to Tora & Osomatsu-san returning from their graves and shows like Charlotte, DanMachi, Fate Stay/Night Unlimited Blade Works, & One Punch Man gathering a lot of hype. It was a year of anime changing hands (Gintama & Disappearance of Nagato Yuki-chan) & giant studios failing (ufotable @ God Eater) or shutting down altogether (Manglobe @ Gangsta.). A lot of mistakes were made and there was a lot of disappointment associated with that. When some good anime with potential fell flat on their face, when an episode wasn't there on time, when the animation quality deteriorated so much that it was painful to watch; quality-wise, 2015 wasn't that great. But seeing the amount of anime that came out this year (over 150 or so), that drop in quality is to be expected. Anyways, here on this page, you will find all anime related stuff that I did (by did I mean posted about) in the year 2015. Which includes all the first impressions, seasonal reviews, episodic reaction/reviews etc. - basically things that aren't on the Reviews page. I'll be categorising everything according to the four Anime seasons. Since, I started my blog in the Spring Season, we'll start from there. So, let us begin.